Long gone is the era when automating business processes used to be a daunting task for businesses. Today, in the 21st century, major technological developments seem to have immensely impacted the way how we see and do things as compared to a decade ago. With advanced technological capabilities and automation & robotics solutions being offered by companies globally, things which once seemed like a dream are today a reality. In the recent past, industries all across the globe have very well understood the significance of these solutions and their usage in their manufacturing units and other critical processes. And similarly, solution providers have also analysed the possibilities innovating in the areas of automation and robotics. Working on the similar lines is Apex Automation and Robotics. Based in Sydney, Australia, the company brings specialisation in designing and manufacturing of custom-built automation machines and robotic systems. Apex Automation and Robotics is an innovative team of capable professionals, who work towards delivering quality-tested range of automation and robotics solutions to businesses operating across different industries. It offers an extensive range of turnkey systems developed by its engineering team from concept to production including mechanical and electrical design, PLC and Robot programming and risk assessment. Its offerings include Robotic Cells, Automation Systems, Machine Vision & Laser Scanning Systems and RFID Applications. The company is also a leading supplier of automation machines for the plastics industry. “Over the years, we have developed a range of products for this industry, including robotic systems to handle unstable bottles and containers with complex packing and palletising configurations,” specifies Dany Seif, General Manager, Apex Automation and Robotics. 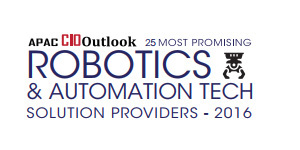 In the past, Apex has installed over 50 systems including 12 robotic cells. These were majorly the full turnkey systems, developed from concept incorporating mechanical and electrical design and software development by the company’s team of capable engineers. With advanced infrastructure facilities, a proficient team and the urge to offer the best to its clients, the company has consistently been growing amid thriving competition in the market. Ever since its inception, the company has continuously emphasized on building its team as a strong force that works towards its growth. As an outcome, Apex today has an accomplished team of engineers specialised in Mechanical, Mechatronics, and Electrical & Controls. These engineers have consistently helped the organization derive an optimal concept for each application. For every project, they use AutoCAD or Inventor for 3D design to turn these concepts into design and manage the project skilfully from the building stage to completion. Apex Automation and Robotics has gained a reputation of using the most suitable technology for each application. Under ‘flexible automation’ we have projects that use industrial robots. The company is also associated with some leading technology companies that enable it to provide the latest technologies to its customers. Some of Apex’s technology partners are ABB, OMRON, Rexroth, Schneider Electric and Rockwell Automation. “These technology partners keep our finger on the pulse of their latest developments and product range to make sure that we utilise the most suitable technology for our automation solutions, adds Dany. The Apex team also ensures that their partners assure the highest possible degree of technical support to the customers after the completion of project. The company’s vision is to stay abreast of the latest technologies and assist its customers with advanced and suitable technological solutions and that’s what it plans to ensure, in the years to come. “Apex Automation and Robotics has gained a reputation of using the most suitable technology for each application. Under ‘flexible automation’ we have projects that use industrial robots,” proudly says Dany.